Unemployment rates were higher in June than a year earlier in all 372 metropolitan areas, the Bureau of Labor Statistics of the U.S. Department of Labor reported today. Eighteen areas recorded jobless rates of at least 15.0 percent, while 9 areas registered rates below 5.0 percent. The national unemployment rate in June was 9.7 percent, not seasonally adjusted, up from 5.7 percent a year earlier. 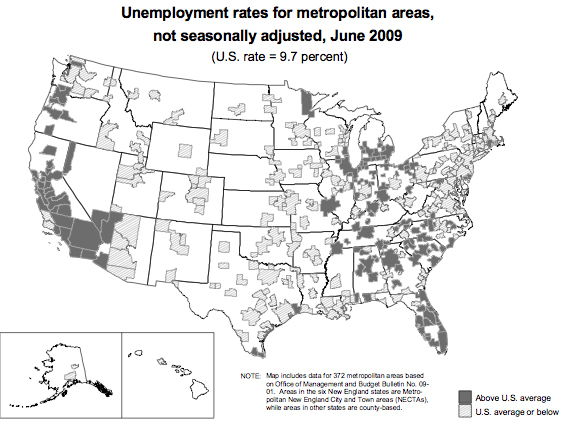 Among the 369 metropolitan areas for which nonfarm payroll data were available, 352 areas reported over-the-year declines in employment, 16 reported increases, and 1 had no change. This entry was posted in Uncategorized on July 29, 2009 by coronino.